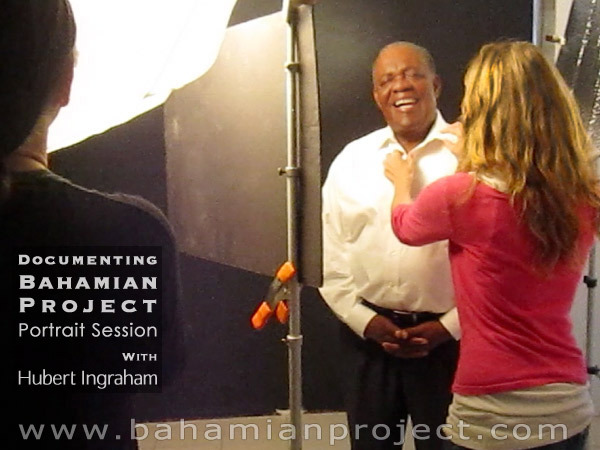 This picture of Hubert Ingraham was taken right as we prepared to photograph him for the Bahamian Project. The final portrait images will be unveiled at the Exhibition Opening at the National Art Gallery of The Bahamas on July 11, 2013. Hubert Alexander Ingraham was born in Grand Bahama and grew up in Cooper’s Town, Abaco, the son of an earnest stevedore in a hard-working, blue-collar family. He studied law in Nassau and subsequently became a senior partner at the law firm Christie, Ingraham and Co. in the early 1970s. In August 1992, Mr. Ingraham led the Free National Movement to victory over the Progressive Liberal Party… thereby ending the 25-year reign of Prime Minister Lynden Pindling. Throughout his career as a politician, Mr. Ingraham maintained that the Free National Movement strived to renew trust in government. While Lynden Pindling is credited with the independence of the Bahamas, it is Hubert Ingraham who enabled freedom of speech when he opened broadcasting to the private sector. The very people who might criticize him today, can do so openly, candidly, and without fear of reprisal on the nations airwaves – thanks to Mr. Ingraham. While Mr. Ingraham is credited with many noteworthy achievements, this is undoubtedly amongst the greatest. That, and the fact that he left public office with clean hands and the respect of the people of his country. He arrived at our studio fifteen minutes early dressed formally. As we were seeking a more casual look we asked him to remove his suit coat and tie. We captured Mr. Ingraham throwing his head back in the midst of a hearty laugh – a contagious laugh, because soon all of us in the studio were laughing along with him. Hats off to Mr. Ingraham. We are proud of you Sir. Thank you Mr. Ingraham for your vision you had for this country. May God bless you and yours.